سلطانی, لیلا, فرنوش, فهیمه, پیشرو, نیره. (1394). زندگی پیاده گذر پیاده از میدان امام حسین(ع) تا شهدا. مجله علمی-ترویجی منظر, 7(31), 38-47. لیلا سلطانی; فهیمه فرنوش; نیره پیشرو. "زندگی پیاده گذر پیاده از میدان امام حسین(ع) تا شهدا". 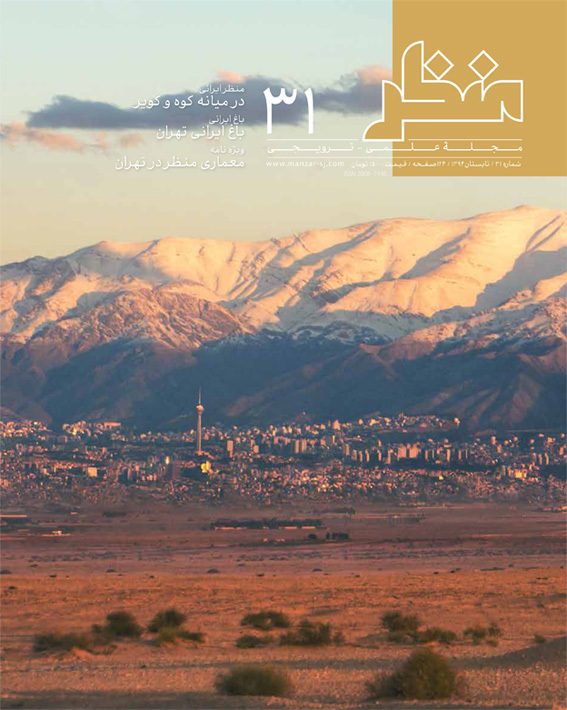 مجله علمی-ترویجی منظر, 7, 31, 1394, 38-47. سلطانی, لیلا, فرنوش, فهیمه, پیشرو, نیره. (1394). 'زندگی پیاده گذر پیاده از میدان امام حسین(ع) تا شهدا', مجله علمی-ترویجی منظر, 7(31), pp. 38-47. سلطانی, لیلا, فرنوش, فهیمه, پیشرو, نیره. زندگی پیاده گذر پیاده از میدان امام حسین(ع) تا شهدا. مجله علمی-ترویجی منظر, 1394; 7(31): 38-47. پیاده‌پذیری فضاهای شهری کیفیتی است که صرف‌نظر از رابطه مستقیمی که با مؤلفه‌های حس مکان دارد، وابسته به روندی است که طی آن شهرها و مکان‌های شهری را می‌سازیم. روند شکل‌گیری هر فضا، تأثیری ژرف بر چگونگی زندگی جاری در آن دارد. بر این اساس ارزیابی روند مذکور منضم به اندازه‌گیری پیاده‌پذیری مکان (بر مبنای جنبه‌های حس مکان) و تدقیق ویژگی‌های کیفی آن، می‌تواند بن‌مایه ساماندهی، برنامه‌ریزی و گزینش قواعد شهرسازانه باشد. اگرچه با توجه به ماهیت پایان‌ناپذیر طرح‌های شهری، سنجش محتوایی طرح‌های مرتبط با پیاده‌راه‌‌ها از طریق ارزیابی مؤلفه‌های مکان از سه جنبه کالبدی (بوم‌شناختی، فضایی، ریخت‌شناسانه، زمینه‌ای، بصری)، ذهنی (دریافتی) و رفتاری (اجتماعی، کارکردی و گزینشی) امری الزامی است، لیکن در بازه زمانی حاضر که طرح‌های متعدد پیاده‌راه‌سازی در کلانشهر پایتخت1 از مبادی مختلف مطرح گردیده، که بعضاً فارغ از اسناد مصوب و یا در دست تبیین و تصویب2 توسعه شهری است. بررسی فرایند تبیین طرح‌ها (در چارچوب مراحل پنج‌گانه تعریف، برنامه‌ریزی و طراحی، اجرا و بازخورد) و ارزیابی روند اقدامات مشابه پیشین و دستاورد چنین رویکردهایی به ضرورتی اولیه تبدیل شده است. این نوشتار مجال کوتاهی است تا فرایند تبیین طرح پیاده‌راه‌سازی محور هفده شهریور، حد فاصل میدان امام حسین(ع) و میدان شهدا با هدف ایجاد مکانی برای توسعه مدنی، ترویج زندگی فرهنگی-اجتماعی و ایجاد محلی برای مراسم آیینی مورد بررسی قرار گیرد. Sidewalk ability in urban spaces is a quality that despite the direct relationship with the components of sense of place depends on the process by which we build cities and urban areas. The formation process of each space has a profound effect on how life goes on. Accordingly, evaluation of the said process to measure the sidewalk ability of a location (based on the aspects of sense of place) and scrutinize its qualitative characteristics could be the theme of organizing, planning and selection of urban-build rules. Although regarding to endless nature of urban plans, contextual evaluation of projects related to sidewalks through evaluation of a space components in three physical aspects (ecological, spatial, morphological, contextual, visual), mental (perceptual) and behavioral (social, functional and selective) is necessary, but at the current time that multiple projects of sidewalk ability in metropolitan capital are raised from different origins which some are free from approved documents or are under determination and approval of urban development. Considering the process of projects explanation (within the five-stage framework of definition, planning and design, implementation and feedback) and assessment of previous similar measures and achievement of such approaches has become more urgent. The ultimate goal of the sidewalk project of 17-Shahrivar path, the Imam Hossein and Shohada Square is to improve the quality of the squares, create a place for civil privilege, promote cultural- social life, and create a place for gatherings and ritual ceremonies. However the current living space and improving its quality depends on the historical process in which urban space is formed. The main reason for the failure of the project is in the explanation process including defining, planning and design, implementation and feedback. Environmental intervention could not be the result of thought and values ​​of a small crowd of programmers, designers or administrators, but it is necessary to form based on a transparent, reasonable, rational and participatory process. The relationship between man and man-made urban-environment space is a civil relationship in which the quality shapes the audience behavior patterns. Improving quality, creating a reasonable balance between the different roles of urban areas and focusing on the role of civil society ensures the survival of this relationship. The impact of management factor on the process of implementing a project should never be ignored. In the process of improving the quality of place, going out of daily decisions, and taste-based policies environment which will reversely lead to the reduction of qualitative values; Strategic guidance and management of the city based on landscape and the approved documents of development which being formed on partnership process and common values ​​of community and stakeholders; control of project realization in proportion to the nature and time of the project and after-implementation assessment which ensure the urban activities system; all are integral rings of a chain and in fact open a socio-political world from which a place has found its existence.